There had been speculation that the American Petroleum Institute (API) was evaluating existing practices for tent siting evaluations, and this was confirmed when the API Process Safety Committee released a draft report titled, “Management of Hazards Associated with Location of Process Plant Tents,” at the end of 2013. This recommended practice (RP 756) provides guidance for managing risk from explosions, fires, and toxic material releases to on-site personnel located in tents. The API Committee’s draft report evaluates recommended practices concerning five different types of tents utilized, including air-inflated structures. Tents included in the tent siting evaluation study are intended for occupancy and may be used for breaks or meals, weather shelters, change houses, orientation, training, meetings, tool stations, offices, laboratories, or equipment assembly, just to name a few. API 756 suggests tents for these uses and others will be required to meet the owner/operator’s tent siting evaluation criteria, and mitigate consequences or risk where required. [i] Air-inflated structures, or Dynamic Air Shelters (DAS), are considered to be the solution to minimize these risks and comply with API’s newly recommended practices. 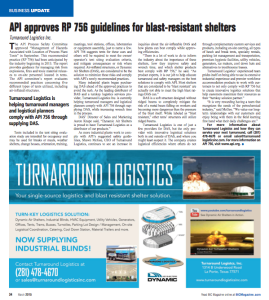 It is unknown as to the exact date that API 756 will be approved and begin to be recommended, but industrial plants are already beginning to purchase DAS ahead of the recommendation of these practices and ahead of the rush. 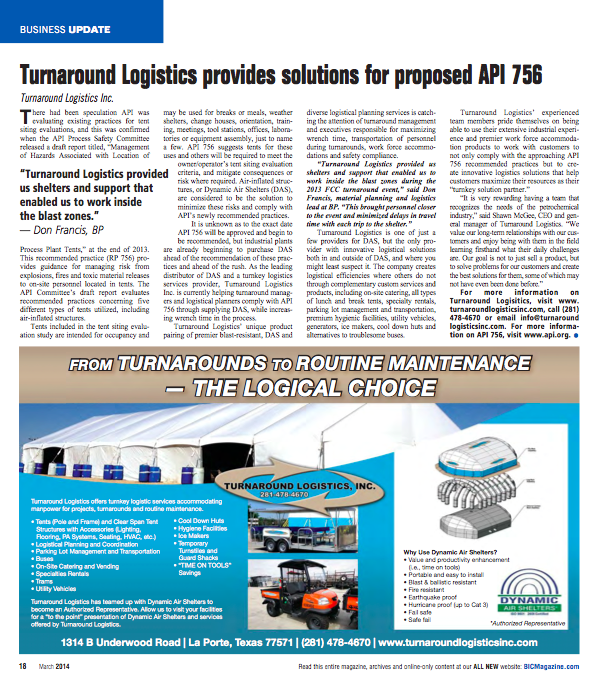 As the leading distributor of DAS and a turnkey logistics services provider, Turnaround Logistics, Inc. is currently helping turnaround managers and logistical planners comply with API 756 through supplying DAS, while increasing wrench time in the process. Turnaround Logistics’ unique product pairing of premier blast-resistant, DAS and diverse logistical planning services is catching the attention of turnaround management and executives responsible for maximizing wrench time, transportation of personnel during turnarounds, workforce accommodations, and safety compliance. 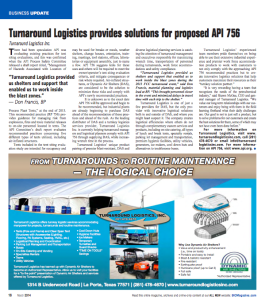 Turnaround Logistics is one of just a few providers for DAS, but the only provider with innovative logistical solutions both in and outside of DAS, and where you might least suspect it. The company creates logistical efficiencies where others do not through complementary custom services and products, including on-site catering, all types of lunch and break tents, specialty rentals, parking lot management and transportation, premium hygienic facilities, utility vehicles, generators, ice makers, cool down huts, and alternatives to troublesome busses. View this article published in BIC Magazine (March 2014). 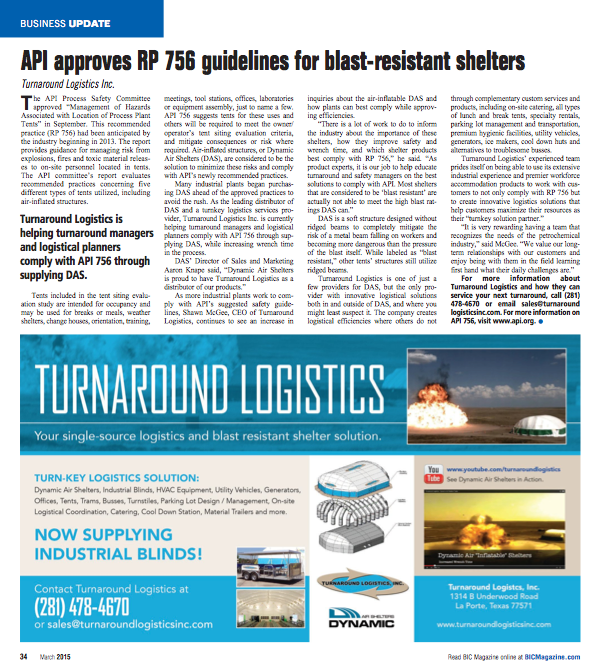 More information regarding API 756 can be found at www.api.org. [i] Management of Hazards Associated with Location of Process Plant Tents. Rep. American Petroleum Institute, n.d. Web. 06 Feb. 2014. http://ballots.api.org/ProcessSafety/RP756Draft11.pdf.